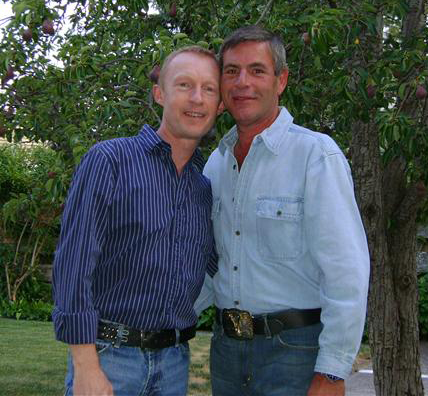 My husband, Bob, and I met three years ago through an online dating site. I am 50 and he is 52. On April 25, we celebrated our 2nd wedding anniversary apart—talking over Skype. We were married here in my home province of Nova Scotia, Canada. I know this may sound cliché, but it was the happiest day of our lives. We were surrounded by friends and family. One of our friends has commented more there once that it was a beautiful service, so much love and warmth in the room that day. At a time when we should be building a life, maybe buying a home, we are forced to live apart because the federal government in the US does not recognize our marriage. Bob is an American and because of DOMA he cannot sponsor me as his spouse to join him in the US. So we are forced to live apart in separate countries. Even though we were legally married, we are nothing more than strangers in the eyes of the US federal government because we are gay. No rational person could justify this discrimination against a gay American who is denied the right to live together with his spouse. 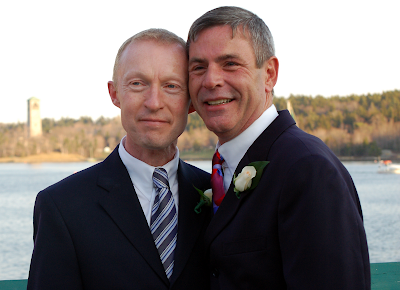 With the appropriate family-based immigration route blocked by DOMA, the only way Bob and I could be together in the US is if I could get a work or student visa, and even that is not a permanent solution, it would just buy us some time. We looked at one college and they required that we show proof of $30, 000 in the bank to cover living costs and this was for one year. So that was not an option. With the downturn in the US economy, it makes it more of a challenge to find an employer who would be willing to sponsor me for a work visa. None of this should be necessary. We should be able to be together like any other married couple. So, I visit him as often as I can. I am self-employed here, which has afforded me some flexibility in when and how long I can visit him. In the almost 3 years we have been together I have been able to visit him 6 times, the last being for 6 months, which we both agreed was a luxury for us. He has been able to come here twice, once for our wedding and the second for our first wedding anniversary. Going through US customs and immigration when I visit Bob brings its own share of stress. I must be prepared to answer any questions about my vacations to visit Bob and to ensure that the officer understands that my intention is temporary and that I will definitely be returning home at the conclusion of the visit. It never gets any easier and as I make plans to visit Bob in June, the thought of going through customs stresses me out more than you can imagine. Try to imagine what it would be like to separated from the one you love by something that you cannot control. I am tired of having to say goodbye to my husband in airports, not knowing when we will be able to be together again. Everyday that we are apart is a day lost that we can never get back. I don't want to see tears of sadness in Bob's eyes anymore, only tears of happiness. It breaks my heart every time I have to say goodbye to him after one of our visits. I have begun to have a love/hate relationship with airports. I count down the days until I can see him, but even when we are together, I am always reminded that our time together is limited. Bob recently told me it rips his heart out every time we have to say good bye from one of our visits. Nobody should have to go though this, nobody! Bob and I just want to be able to begin living our lives as a married couple. Is that too much to ask for? Just to be able to live under the same roof and be able to talk to each other face to face, instead of on a web cam, is what we hope for everyday. We meet every night at the same time and share our day, it makes this whole situation a little more bearable. As I write this Bob is back in California, packing up the house and getting ready to move. I can't even be there to help him. He has accepted a new position in another state. We are leaving behind some really great friends, who I will not get a chance to say goodbye to. I can't afford to go right now because I am saving for my to trip to visit him this summer. I will be with him for a little over 2 months. It will be the first time I have seen him since December of last year. I feel most days like I live between two worlds and I guess I do. This is our life for now. Me here and Bob there, never knowing when or if we can actually be able to live our lives together. So every day we watch and wait for any information, any hope, that the laws will change that will allow Bob and me to be together. I have met other couples like us and I have been able to talk with other couples who are facing their own challenges. Learning how they cope has been a great support for me and for us. There are some days when it all becomes too much, but you dig deep and push on with the hope that tomorrow could be the day that we all get to be with the ones we love. The time has come to repeal DOMA or pass the Uniting Families Act. The suffering that gay binational couples face must stop. We need to share our stories so that people become aware of the injustices we face everyday. I hope above all hope, that this year, will be the year that I hear Bob say, “Welcome home”! I know the feeling. I'm Mexican and and got married with Vincent in Iowa. We lived together in Mexico City, but the time came when he had to move to California and start in another job (the opportunities for him to work here are null, due to discrimination). Last year, I visited him almost 7 times. Sometimes small weekends, or the whole Christmas and New Year's festivities. To arrive to the flat we used to share and not finding him there is painful, as sleeping alone. The chats on Skype help, but are not enough. DOMA must be repeal and UAFA must be pass. We're another couple who knows all too well what you're going through. The part about having your heart ripped out at the airport ... That is the absolute worst feeling. :,( Is anyone listening? Does anyone give a damn? Talking to rights groups and congressional delegates, it seems they don't have a great sense of urgency with all of this.